Welcome to Six Words from SMITH Magazine. Writing in Six Words is a simple, creative way to get to the essence of anything—from the breaking news of the day to your own life and the way you live it. 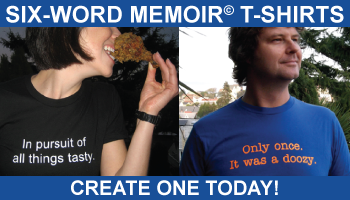 Since the Six-Word Memoir® debuted as a project of SMITH Magazine, more than 700,000 short life stories have been shared on Six-Word Memoirs and its younger cousin, SMITH Teens. In classrooms and boardrooms, churches and synagogues, veterans’ groups and across the dinner table, Six-Word Memoirs have become a powerful tool to catalyze conversation, spark imagination or break the ice. Honest Tea bottle caps, Six-a-Day calendar, a board game, and as form of engagement with partners ranging from The Tony Awards to MINI Cooper. Celebrities from Stephen Colbert to Dave Eggers and many more have shared their own Six-Worders—check them out on our Six in the News page. Six Words is a bestselling book series, including Not Quite What I Was Planning: Six-Word Memoirs by Writers Famous & Obscure, Six-Word Memoirs on Love & Heartbreak, Six-Word Memoirs by Teens Famous & Obscure., It All Changed in an Instant: More Six-Word Memoirs by Writers Famous & Obscure., Six Words About Work (with Mercer Consulting) and Oy! Only Six? Why Not More? Six Words on Jewish Life (with Reboot). You can purchase any of our Six Word books on the books page. From ESPN to MINI Cooper and many more, SMITH has partnered with and licensed its trademarked Six-Word form to companies in print, digital, radio, and television. We’re pleased to bring our storytelling expertise and lively, engaged community to yours. Contact Bob AT sixwordmemoirs.com for more information. Since we launched the Six-Word Memoir project, educators of all kinds have found six words to be a terrific classroom assignment and catalyst for self-expression. 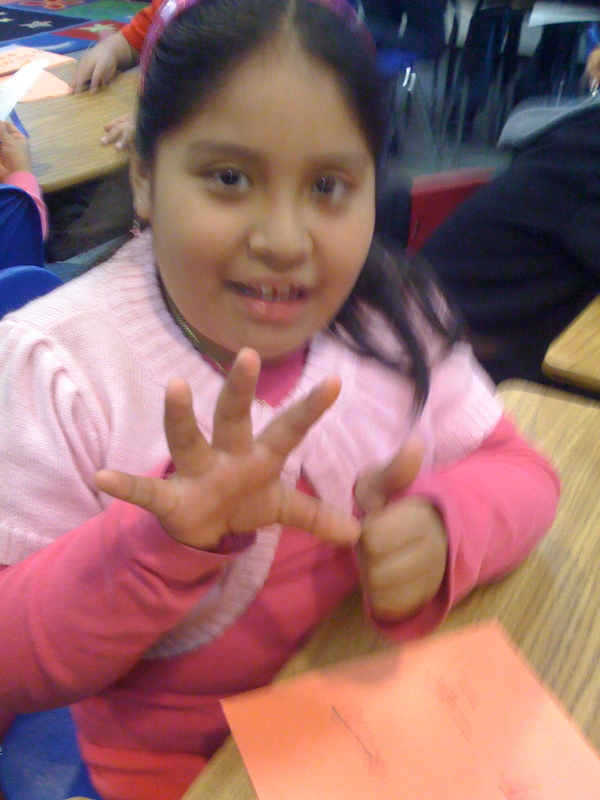 At our Six in Schools section we celebrate students’ work from classrooms across the world. This fall we’re introducing a suite of new school-based teaching tools in partnership with VCOM. Please stay tuned for updates on this exciting new launch. We’re launching a nationwide Six-Word Memoir project for art schools—check out our eBook with the TED conference, Things Don’t Have to Be Complicated: Illustrated Six-Word Memoirs by Students Making Sense of the World for a peek at the elegance and intensity of the illustrated Six-Word Memoir. 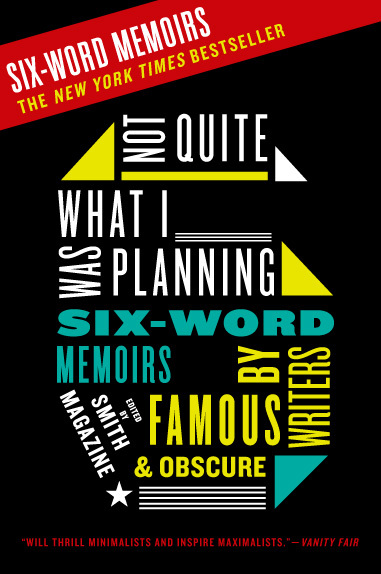 • If one of my Six-Worders is selected for a book, will I be notified? We don’t pay for stories. However, if you’re story is selected for a Six-Word book you’ll receive a free copy. Given that these books cost between $12-$15, that means you’ll have made $2-$3 a word. 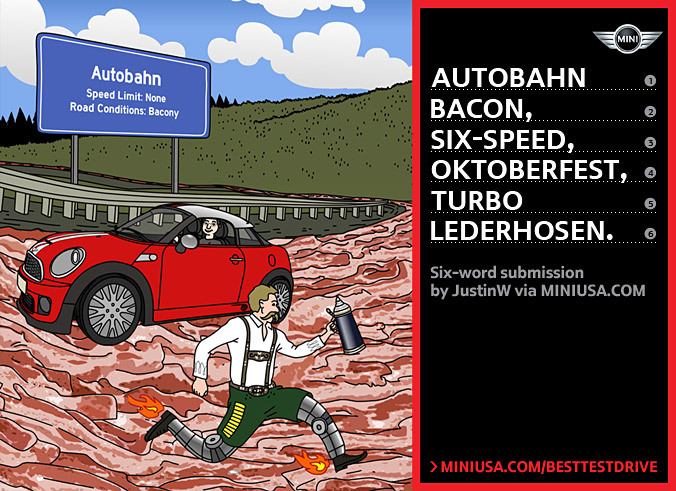 If you republish your words elsewhere, we do require you to include this credit line: “First appeared in Six-Word Memoirs®, sixwordmemoirs.com.” By registering on Six Words, you agree to our Terms of service where our copyright policies can be read in more detail. • How can I keep up with the latest contests, events, books and all other doings in the world of Six? 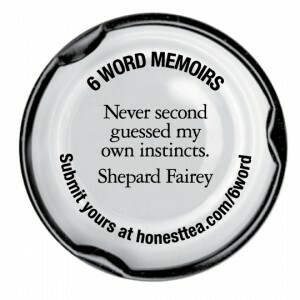 You can join the Daily Six newsletter when you first register for Six Words, or by submitting your email in the top right-hand corner of SixWordMemoirs.com. Become a fan of Six Words on Facebook for updates about new projects, contests, and events. And follow us on Twitter to get daily tweets with some of the best Six-Worders of the day, new six-word challenges, and quick and fun contests.